The Crystal of the Day for Friday 13 September 2013 is Pink Halite. 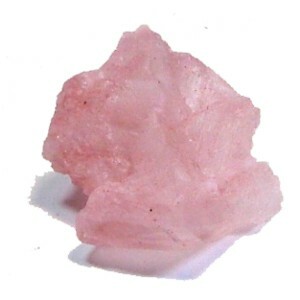 Pink Halite harmonizes the heart and solar plexus chakras, making it a wonderful stone to promote self-love. Pink Halite dissolves confusion and doubt and it assists one to clean up the spiritual or physical environment of unhealthy habits, relationships, incomplete projects, etc. Use Pink Halite to cleanse the heart of emotional wounds and to take positive action towards a more self-loving lifestyle. Some use it in bath water to clear and restore spiritual energy. One piece can be used repeatedly until it eventually dissolves.